Dead Mans Hand from Joker Juice. Graham Cracker, Caramel, Peanut Butter, Custard, Banana and Cream. For those of you that are unsure what Graham Cracker is, it's a type of of Cookie Confectionery. So this vape consists of Cookies, gooey caramel, smooth Peanut Butter, vanilla Custard, fresh Bananas and lashings of Cream, quiet possibly the most extravagant E-Liquid ever. 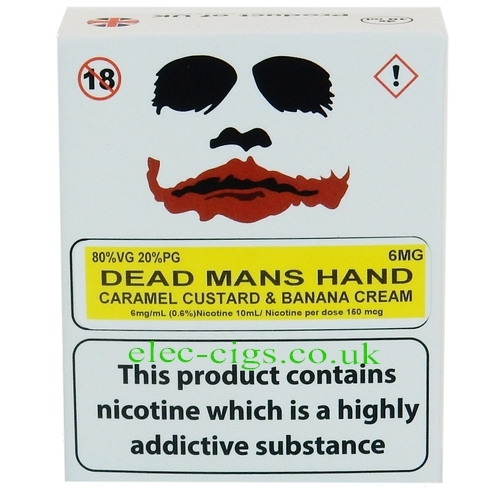 Dead Mans Hand from Joker Juice is a great 80-20 (VG/PG) mix with a choice of either 3 mg (0.3%) or 6 mg (0.6%) of nicotine. It is sold in 3 x 10 ML plastic bottles inside a cardboard outer box. Dead Mans Hand from Joker Juice can only be purchased by persons aged 18 or over. This product contains nicotine which is a highly addictive substance.